Dave Brubeck was one of those rare musicians who seemed to spring forth from nowhere to overnight prominence (in his case, in the late 1940’s) and whose popularity, both as a musician and a person, remained undiminished until his death, on December 4, 2012, just one day short of his 92nd birthday. During a career that spanned seven decades, Brubeck released scores of albums, one of which I have already talked about previously in JFASN #100. The album I chose to discuss that time, “A Cut Above,” was somewhat notorious for its use of electronic instruments, which to this day remain anathema to many “serious” jazz musicians. He also eschewed his regular working quartet of the time and instead installed his sons as sidemen. Please refer to that earlier article for any further biographical details about Brubeck and his unparalleled career. The album I want to talk about this week probably does not fall into the same league as far as inspiring critics and fans alike to react with disgust. However, it is not what anyone would call a “normal” Brubeck album. “Mister Broadway” fared worse even than “Peter Gunn” and ended after only 13 episodes. Today the show is so obscure that the normally reliable Internet Movie Database has no listing for it, and even YouTube has only one short clip from it. Luckily for us, Brubeck’s producer Teo Macero and others decided that the music Brubeck wrote for the series could be and should be expanded beyond the snippets that comprises the vast majority of music written for episodic TV. The hustle and bustle of life in New York is caught in the opening number which is, appropriately, “Theme From Mister Broadway,” an extended (but still less than 2 and a half minutes long) version of the series’ theme song. This is a robust, polyrhythmic romp that races along and seems to end before it’s even begun. “Broadway Bossa Nova” is perhaps not quite what you would expect from the title, which to me conjures up an image of random pandemonium mixed with a Latin beat. It has the Latin beat all right, nicely integrated into a quiet little melody that is hardly reflecting pandemonium. Overall, however, it is a nice tune. “Autumn In Washington Square” is, according to the liner notes, one of four waltzes on the disc. It doesn’t really sound like a waltz to me, and it opens with a contemplative air as Brubeck gives us an uncharacteristically quiet header and intro that lasts until Desmond takes over just short of the two minute mark. Desmond’s performances normally have some life to them, even if they lack Brubeck’s normally bombastic piano style. Here he is reined in, continuing in the same subdued vein Brubeck used. This leaves one to wonder, are they trying to evoke a somber mood to replicate the feeling at the inevitable end of summer and approach of winter, along with the attendant changes that triggers? Or was it because of something more specific to do with one of the show’s episodes? Your guess is as good as mine because the liner notes are silent on that point. “Summer On The Sound” is, according to the liner notes, another waltz, but that is pretty much the only thing it has in common with the other waltz we’ve discussed, “Autumn In Washington Square.” Whereas “Autumn” is dark and gloomy, “Summer” has an open and warm and expansive feel to it. To risk repeating myself, I will say that to my admittedly untrained ear, neither one sounds like any waltz I’ve ever heard, but hey, that’s just me. Each song is, in its own way, a pleasure to listen to. The last song I have time to talk about is the last track on the album, the intriguingly named “Upstage Rumba.” It turns out that a number of personnel, including the musicians and others who were present in the studio at the time, took the title of this song quite literally. As I mentioned earlier, this is an album that is truly not a “normal” Brubeck album, but at the same time it is. The music is undeniably Brubeck, from beginning to end. So despite the unorthodox beginnings of these songs, I think you’ll find this sleeper of an album has a lot to offer. 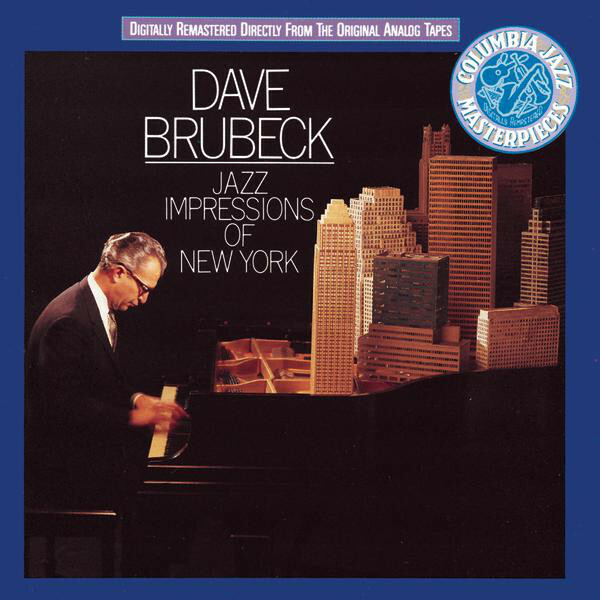 Dave Brubeck’s “Jazz Impressions Of New York” will definitely make a wonderful addition to your personal playlist, for a Saturday or any other night! The album is still available on vinyl and CD at the usual places.